Where antennas are installed, IEC 60728-11 calls for earthing measures in addition to bonding of the cable network. Conventional satellite and terrestrial antennas are almost exclusively installed on the roofs of buildings. Therefore, the IEC 60728-11 (EN 60728-1) standard calls for earthing measures in addition to equipotential bonding and lightning equipotential bonding of the cable network (cable shields). This standard typically applies to stationary systems and devices. Mobile systems (such as caravans) which are also covered by the standard, are not dealt with here. Fig. 1: Permitted earth electrodes. 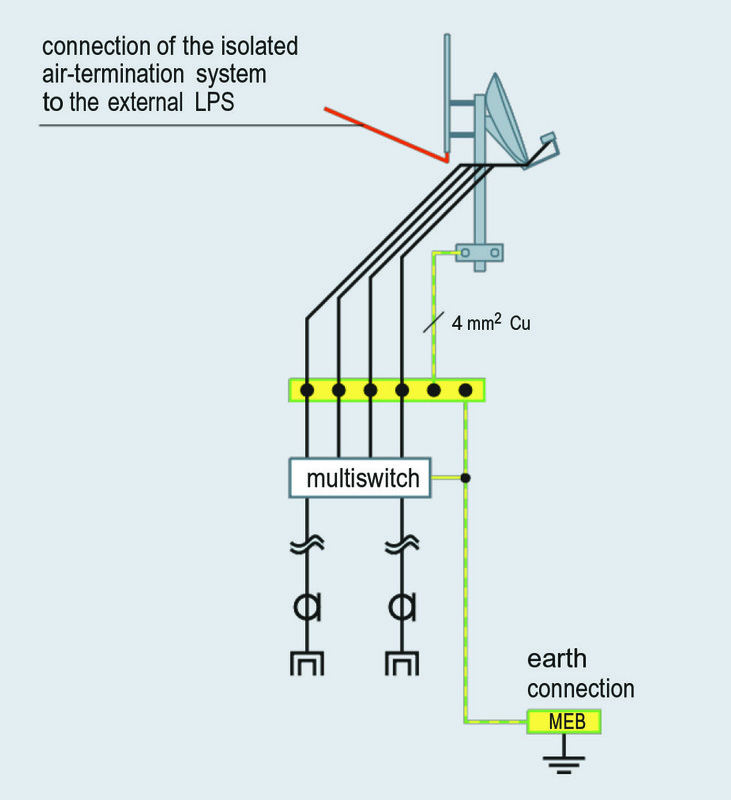 This practical solution does not describe earthing measures for antenna systems installed at locations with low risk of lightning strikes and equipotential bonding in case of letgo threshold currents ≤3,5 mA, which are both not required. 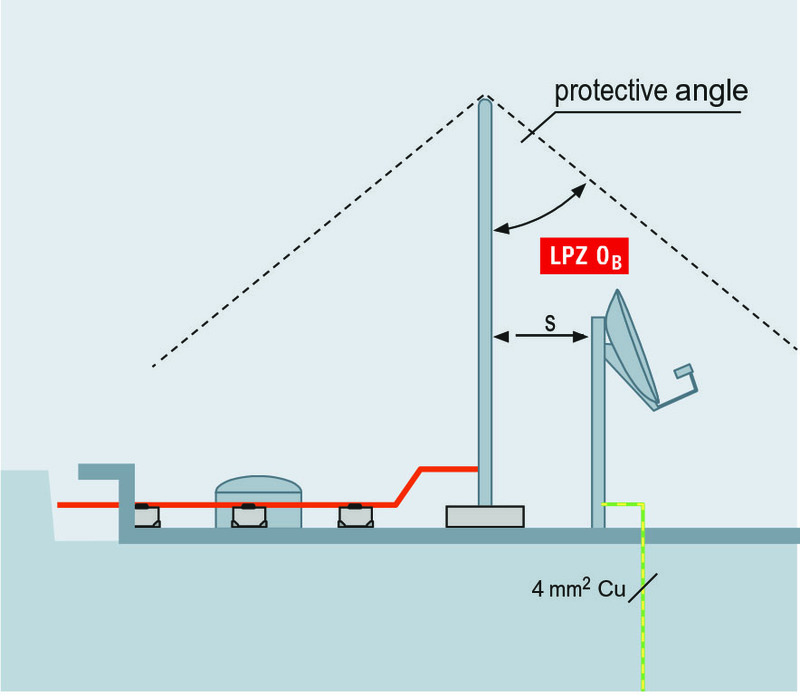 Antennas installed in conformity with this standard generally do not increase the probability of lightning strikes and earthed antenna standpipes are no substitute for lightning protection systems. 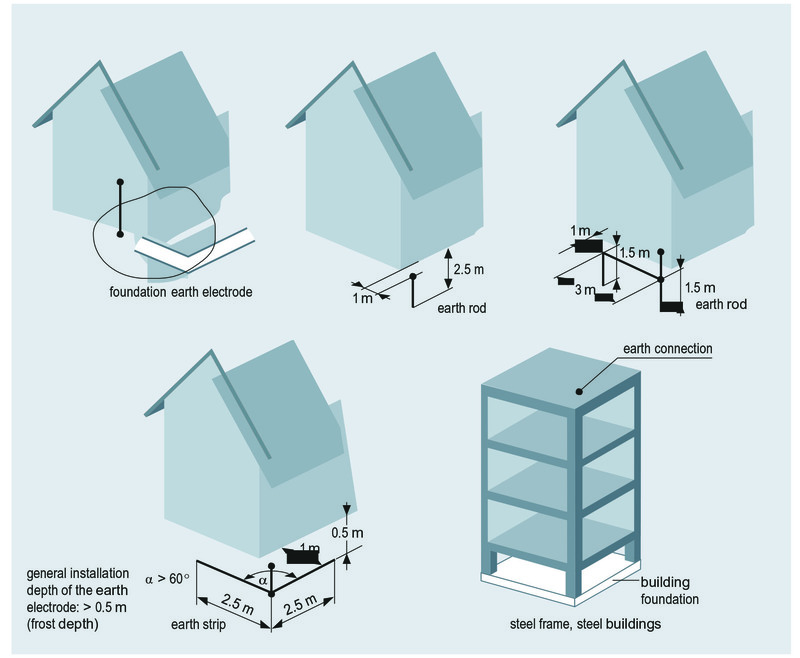 An earth-termination system may consist of one foundation earth electrode, two horizontal earth electrodes (earth strips) with a length of 2,5 m and an angle >60° each, one vertical earth electrode (earth rod) with a length of 2,5 m or two vertical earth electrodes with a length of 1,5 m each, spaced at intervals of 3 m (see Fig. 1). 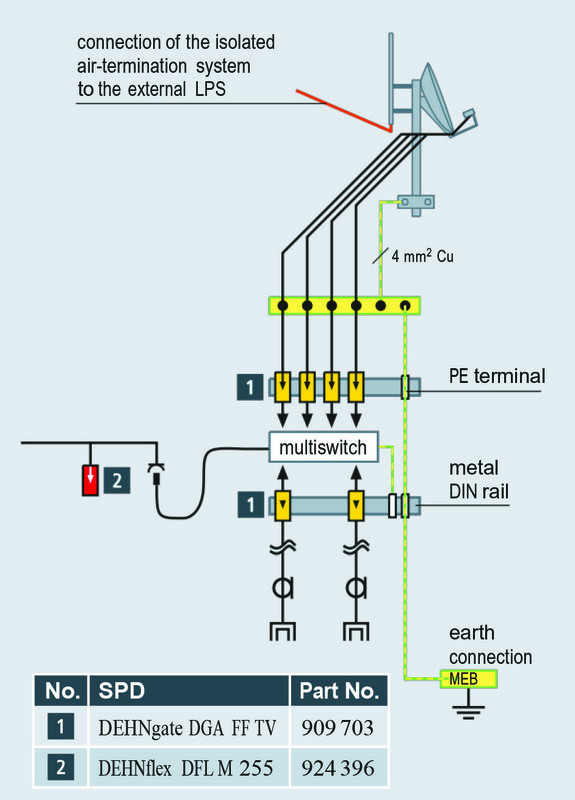 It must be observed that earth termination systems must be connected to the main earthing busbar (MEB). The earth electrode must have a minimum cross section of 50 mm2 (copper) or 90 mm2 (galvanised or stainless steel). Fig. 2: Protective equipotential bonding of the cable network and the devices. To ensure that persons and property are protected, the cable network must be integrated in the protective equipotential bonding of the building. If cables are installed in such a way that they are not mechanically protected, the minimum cross-section is at least 2,5 mm2/4 mm2 (copper). This measure is required due to the discharge currents on the mains side, which are injected from the devices to the cable network. For this reason, all cables entering a building (see Fig. 2) must be connected to the protective equipotential bonding (with the exception of galvanic isolation of the inner and outer conductor). If active and passive devices such as amplifiers or splitters are removed, the cable shields connected to them must be interconnected before removing the devices and the inner conductors must be insulated. Fig. 3: Antenna system with equipotential bonding at the lowest point of the installation and surge protective devices. Special attention must be paid to mains-powered devices of protection class I connected to the cable network. If no integrated TN-S system is installed, system unbalance and the accumulation of the third harmonic can lead to shield currents which can cause malfunction and fire. An internal lightning protection system protects the content of a building, in particular the electrical systems and electronic devices. 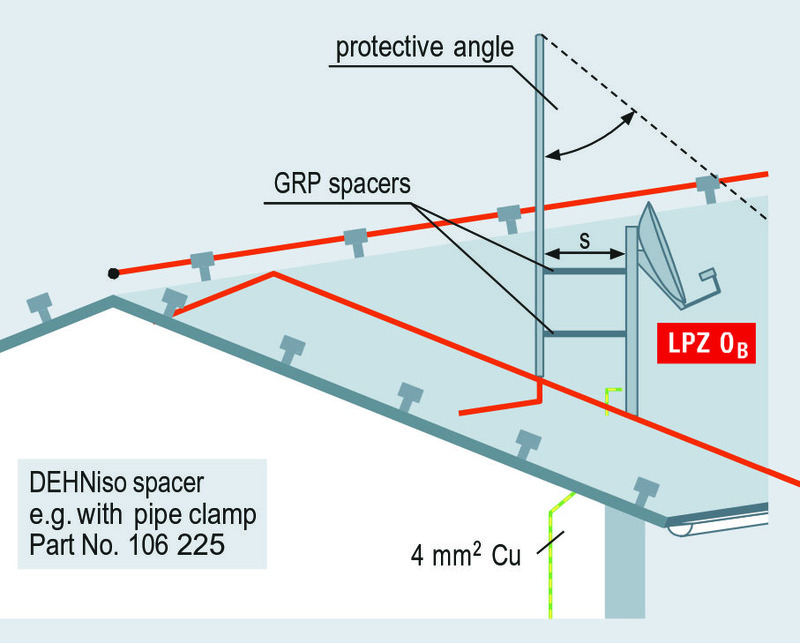 The main function of an internal lightning protection system is to establish lightning equipotential bonding via the 4 mm2 copper conductor and the installation of surge protective devices between the inner and outer conductor to avoid sparking. The protection goal of the surge protective devices at the head-end described in the standard also applies to equivalent installations (see Fig. 3). Fig. 4: Arrangement of antennas which do not have to be earthed. Surge protective devices for a detached house, which are also described in the standard, provide protection from inductive coupling and can also be used for connections in multi-family houses according to the note in the standard. 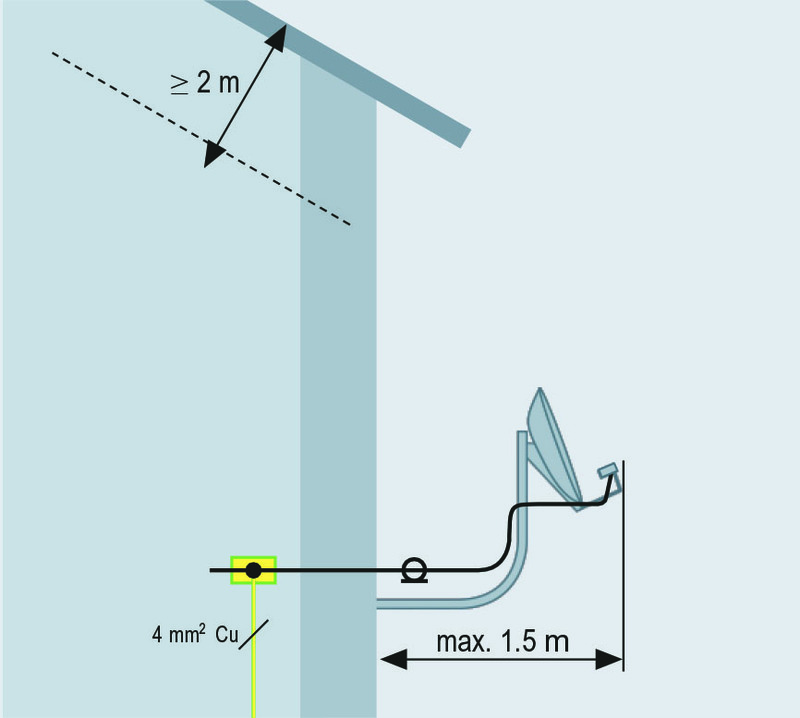 Antenna systems in a building and antenna systems which are located at least 2 m underneath the roof and do not protrude more than 1,5 m from the wall (see Fig. 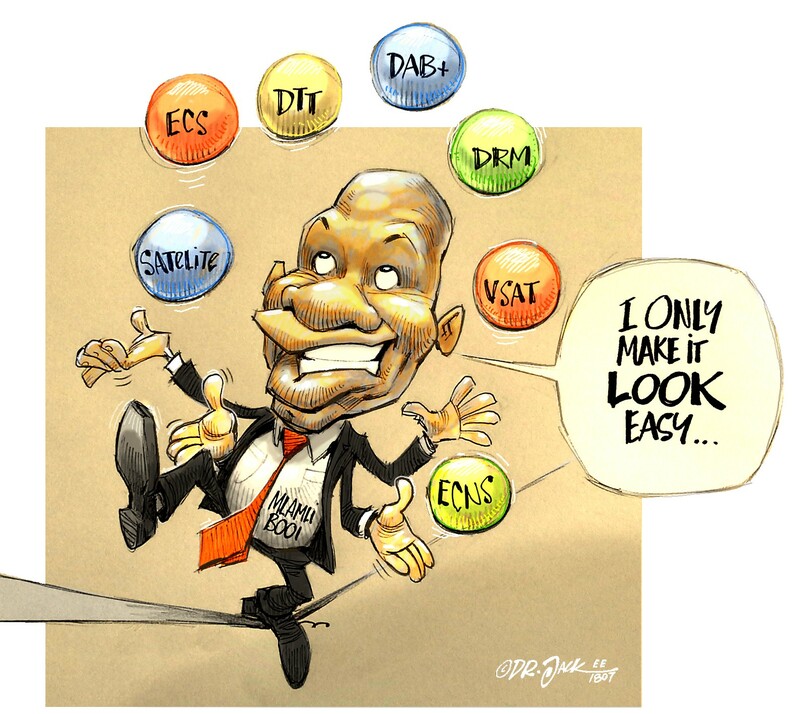 4) do not have to be earthed via an earthing conductor. However, equipotential bonding must be established as described here. The following considerations have been made in conformity with the protection goal of the IEC 62305-3 (EN 62305-3) lightning protection standard and the so-called “best solution(s)” of the antenna standard. Fig. 5: Antenna system located in the protective volume of an existing air-termination system. 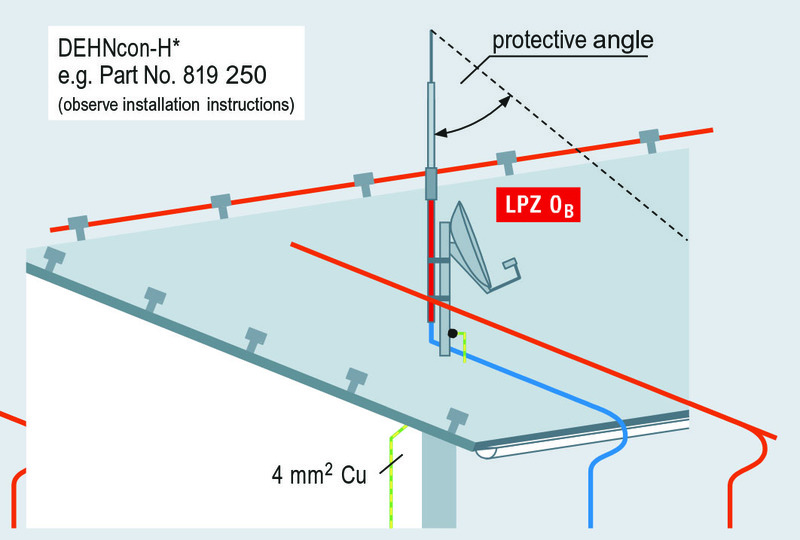 If buildings are equipped with lightning protection systems, the antenna system must be positioned in the protected volume of an existing air-termination system (see Fig. 5) or protected by an air-termination rod isolated by a DEHNiso spacer (see Fig. 6) or by a DEHNcon-H solution (see Fig. 7). In addition to establishing equipotential bonding as described in this article, in all these cases, the lowest point of the cable shields must be connected to the main earthing busbar via copper equipotential bonding conductors with a minimum cross-section of 4 mm2 to reduce the risk of induction loops (see Fig. 3). Earthing measures for antennas do not ensure preventive lightning protection for buildings or any other structures. Fig. 6: Antenna system with an air-termination rod isolated by DEHNiso spacers (insulating clearance made of glass-fibre reinforced plastic. If buildings are not equipped with lightning protection systems, the antenna mast must be earthed. The earthing conductor must be installed vertically, in a straight line, and must have a cross-section of at least 16 mm2 (copper), 25 mm2 (insulated aluminium) or 50 mm2 (steel), as in Fig. 8. The connections of the equipotential bonding conductor, for example to pipe clamps and equipotential bonding bars, must be dimensioned for lightning currents and tested to IEC 62561-1(EN 62561-1). Fig. 7: Antenna system with high voltage-resistant, insulated down conductor DEHNcon-H. The equipotential bonding conductor must be installed as far as possible from conductors and earthed systems as, in case of a lightning strike, the same physical interactions occur that must be observed for keeping the separation distance in an external lightning protection system. In addition, natural components of the building or installation may be used as earthing conductors if they are permitted, electrically conductive and have the same dimensions as standard earthing conductors. Fig. 8: Antenna system with surge protective devices. 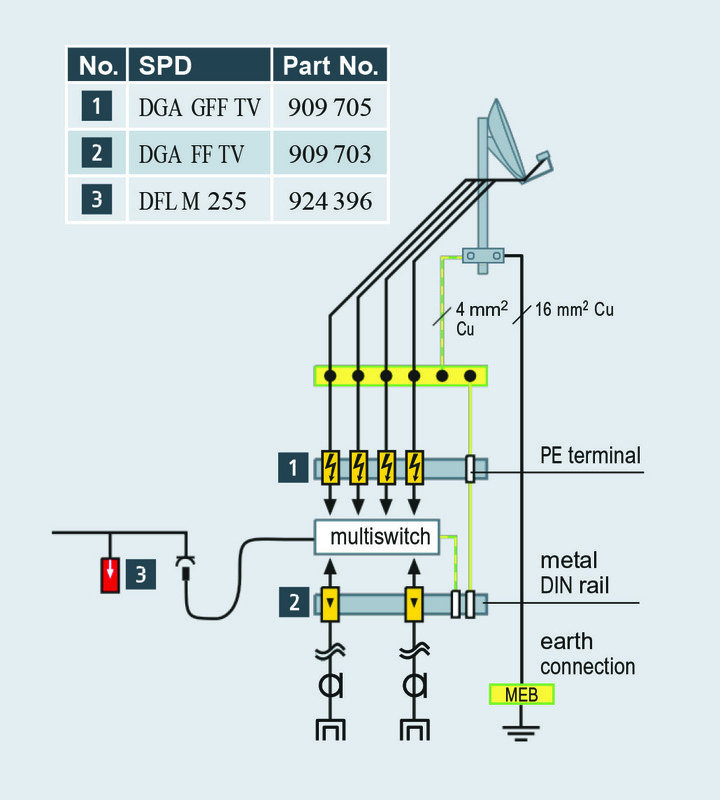 Also, in this case, equipotential bonding must be established as described before, but without connecting the lowest point of the cable shields to the main earthing busbar (see Fig. 8). Lightning strikes are to be expected if broadband cables enter the building,. Therefore, only lightning current-carrying surge protective devices such as DEHNgate GFF TV are used.